Brightrock Games' Josh Bishop details the game's story from Kickstarter to present day. This month's PC Gamer Club game is War for the Overworld, which you can receive in your inbox as part of your membership until the end of July 31st. 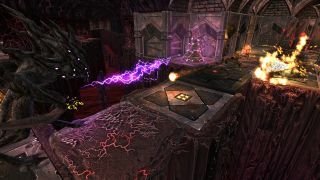 It's a spiritual successor to the likes of Dungeon Keeper 2, and it launched its final expansion in April—The Under Games. Below, we speak to Brightrock Games' Josh Bishop about the game's journey across the last six years, after it was originally funded on Kickstarter back in 2012. What motivated you to start work on War for the Overworld in 2012? I was eight or nine when I first played Dungeon Keeper 2 and I was always hoping I’d see Dungeon Keeper 3 come to fruition. There were some games which were clearly inspired by the series, such as Evil Genius or the original Dungeons…but what I and others on the team really wanted was a pure sequel. After many, many years we became so frustrated that we decided to do it ourselves. It felt like the right time to try: PC gaming was more prevalent than ever thanks to the continuing rise of Steam, Kickstarter was providing a way to fund projects outside of the traditional publisher model, and programs like Greenlight and Early Access were making space for games by aspiring indies. Even though many things came together at the right time, it was still crazy and ambitious—none of us had made a game before, so none of us knew what we were getting ourselves into. What did you want to improve on from the originals? We knew there were things that the community had been frustrated with, like the fact you couldn’t replace walls, the mana system [being] somewhat broken when you stockpiled it, the huge defender advantage and the fairly linear nature of how rooms and spells unlocked. Plus, in the thirteen years since Dungeon Keeper 2, management and RTS games had evolved immensely. People expected some modern conveniences. You hit trouble after your crowdfunding campaign—what happened? Originally, we had planned to create a middleware called Dungeoneer that would sit between the Unity Engine and the game, enabling us to build the game and allow community modding. But it quickly became clear that the…tool simply wasn’t feasible. This cost us four or five months and nearly a third of our budget. In our Kickstarter we said we’d complete the game in eight months, which most people in the industry would rightly tell you was impossible, even for a game much less ambitious than ours. We’d built our whole plan and budget around those eight months, and we lost half of them to this huge misstep. We needed a major shake-up to reverse the downward trajectory. We had to seriously restructure the team and the amount we were paying people. That was tough, but we got through it. In the lead up to release, you were all working out of a rented house in Brighton—what was that like? Getting the team together in one place was wonderful—there really is no substitute for being able to work directly with one another in the same room. Productivity went through the roof, plus the camaraderie of working together allowed us to build a collective spirit that persists today. The house was great too, comfortable enough for six core team members and two significant others. After the rush to release we had a lot of fun being able to relax together, play board games, or setup a session of Dungeons and Dragons in the evenings after work. But it wasn’t something we could maintain long-term. Because we lived where we worked, it was difficult to maintain a healthy work-life balance, which would sometimes strain our relationships. Why did you decide to release the game unfinished? [Following the restructure], Early Access provided a much-needed injection of funds, and the project continued for a few years under a stricter budget. But in early 2015 we were faced with an impossible choice. We’d taken out a bank loan as well as a small loan from our business advisors. This was on top of most of the team forgoing pay completely for several months and living off their personal savings in the house that the company was paying for. With tens of thousands of pounds of debt built up, we didn’t have many options left bar insolvency. We also had game boxes shipping to retail stores all over the world, so we had nowhere left to go. There really wasn’t any choice—the wheels were in motion and the game had to come out. Do you regret releasing it early? Releasing it in the state we did was something we’ll always regret. Not just because we failed ourselves, but we failed our fans as well. To see it go out in such a state and the reaction from the fans was easily the most hurtful thing we’ve ever experienced. They felt betrayed and lied to. That feeling of powerlessness hurt most of all, and knowing how our fans would react was terrifying. But we can’t regret the end result. By releasing when we did, we were able to survive and thrive as a company. We gave ourselves the chance to build a community-focused business and to repair some of the damage that was done. War for the Overworld and Brightrock Games live now because of that difficult decision. What was the first month after release like? Sheer madness. We released 16 patches in the first week, and some of us were working 20-25 hours at a time. I remember one of our programmers didn’t sleep for at least two days and was fueled purely by coffee, energy drinks and takeaway. We slept only when we really had to. After the first week or two things calmed down a bit, though we were still very much in crunch mode. It was a few months before things returned to normal. When did you feel like you could stop putting out fires, and start building new features? The big shift came after the release of Patch 1.2 in September 2015. We fixed up a lot of the loose ends that were still around after 1.1, and we also made a huge balance pass based on all the data and community feedback we’d gathered. From then on, we were starting to look at new features, which was refreshing after months of firefighting. 1.3 introduced the Map Editor and Steam Workshop support; 1.4 introduced our first expansion, Heart of Gold; 1.5 introduced Crucible, a tower defence/survival mode that was free to all players; and 1.6 added the eternally-requested My Pet Dungeon mode, which long-term fans of the genre were already intimately familiar with. Then there’s 2.0, our latest update, which introduced so many things: our latest expansion, The Under Games; two new game modes; completely revamped AI; an entire scripting system for the Map Editor, [and more]. How did you funnel community feedback into the Heart of Gold expansion? We developed it to be much less restrictive in how players could build their dungeons, with larger and more open levels that could be tackled at your own pace, and with a much bigger focus on exploration and discovery. This was in direct response to comments we’d received through all our channels that criticised parts of the main campaign. We also knew players loved the different dungeon art themes and Underlord characters we’d introduced, so we decided to switch things up and let them play this campaign as Underlord Kasita. After 2.0, do you finally feel like you’ve got the game where you wanted it to be? No matter how much work is put in, you always see the flaws and want to change things again. With that said, 2.0 has really done wonders for the game. It’s polished things up even more, and introduced a bunch of awesome new features. We rebuilt the AI, which The Under Games expansion really puts through its paces. Players are having great fun trying to beat it on the hardest settings. We also introduced scripting and custom campaign support for the Map Editor, to encourage even more user-generated content than we had before. I’d say that our goal was to get War for the Overworld to a place where we could step back and it would still live on. It was our hope that we’d be able to leave our community with the tools to create their own adventures, and now they can. Are there still things you wished you’d have added to the game? Boat-loads of things. There’s so much we’d like to do with it, but our other ideas will probably have to wait for a sequel. Something like being able to play as the good guys would be very interesting. But we’d want to do it properly [and] it’d be too big to do as an expansion. What kind of support can players expect for the game going forward? Although we’re looking to move most of our team onto our next game, codenamed “Project Aftercare”, we’re going to support the community for some time to come. We’re still pushing out a few minor updates and tweaks, and we’re still going to support users with issues. I expect we’ll still be releasing patches every now and then for some time, though there are no plans for any more big features. Beyond that, we want to support the creative talents within the community. We’ll be running community spotlights soon to highlight the best maps and campaigns that are being created in the new Map Editor tools. We also plan to create some tutorials so players can get the most out of those tools, and to open the way for more community content, hopefully for years to come. Throughout development, how did you balance tapping into nostalgia with creating something that was very much your own? We wanted to evoke people’s nostalgia for those games, but we had to balance that with our own vision, as well as make sure we didn’t step on anyone’s toes at EA. The main thing for capturing the nostalgia was the look. The Dungeon Keeper games have very strong visual elements that just make you think of the genre in a way that few other games do. [For the mechanics], we introduce the player to the genre’s familiar concepts, make them feel at home, then start throwing curveballs. For example, your dungeon expands through workers claiming territory, you build rooms, then you place defences to protect your Dungeon Core. But we also added the Veins of Evil, a tech tree to manage the unlocking of new items, so players could create their own unique flavour of evil. What would you do differently if you had to go back and do it all over again? My first thought is that we’d go back and try something a little less ambitious for our first game! But assuming we still wanted to make War for the Overworld, I’d make sure we had the right core team when we started. I’d try to address the problems before they happened, and straighten out those early years of the project. Ideally, we’d want to avoid everything that caused major delays, or which put us in such a tight spot by 2015. If we could do that then we could release a game that’s as polished as it is now. That’d solve a lot of problems. Your first impression lasts and it’s a lot of work to make things right.